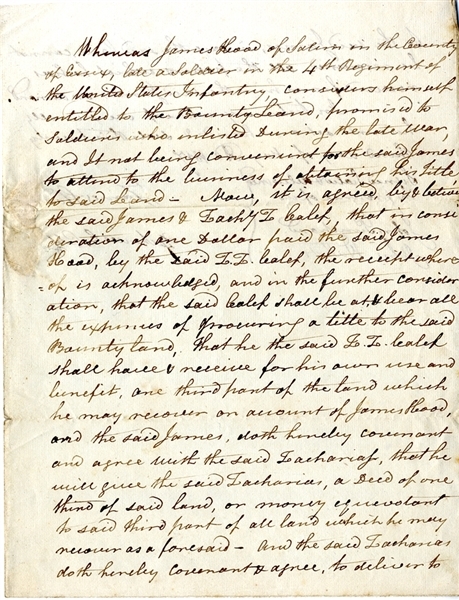 Manuscript Document Signed James Hood and Zachary Caleb, 1-1/2pp. quarto, May 20, 1817, and reads in part: “...Whereas James Hood of Salem in the County of Essex, late a soldier in the 4th Regiment of the United States Infantry, considers himself entitled to the Bounty Land, promised to soldiers who enlisted during the late War and it not being convenient for the said James to attend to the business of obtaining his title to said Land, Now it is agreed by & betwen the said James & Zachy Z. Caleb, that in consideration of one dollar paid the said James Hood by the said Z.Z. Caleb...that the said Caleb shall be at & bear all the expenses of procurring a title to the said Bounty land....that the said Z.Z. Caleb shall have & receive for his own use and benefit, one third part of the land...” Fine condition.